After I had a cocktail to calm my nerves, I knew it was time to get down to business. How many Beanie Babies are we talking? We need to do a thorough sorting and matching. So I start laying them out in a single layer on the table and cover almost the entire table with still more Beanie Babies in the pile to sort. I pushed them all closer together and continued to count. Fifty, Seventy-Five, One Hundred, oh my god! One Hundred! One hundred and ten, One hundred and twenty-five, were there really that many in there? Beanies we displayed as far as the eye could see. 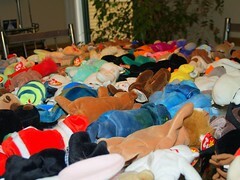 I couldn't believe it, there were One Hundred and Twenty Five UNIQUE Beanie Babies, all with their tags on and all in perfect condition since they've been living in our garage in this big plastic treasure chest. My dreams were about to be fulfilled. But I have to do some homework first! Let's check out eBay before I go any further in this endeavor. But I need to wait, becuase today of all days, when I went to pick up my bottle of Xanax - it was empty. Damn you insomnia! Now I've got to put in a rush order at the Pharmacy.